The zosterophyllophytes (or zosterophylls) are the second major group of vascular plants established by Banks (1975), as the Zosterophyllophytina. They range from Late Silurian to Late Devonian and represent some of the most interesting early vascular plants, in part because there is a considerable amount of anatomical and morphological detail known about them. They demonstrate diversity as early at the Ludlovian (Late Silurian) (Kotyk et al., 2002) and were widespread geographically by the Early Devonian, including Gondwana (Zhu and Kenrick, 1999). As a group they share many features with the Lycophyta and may have given rise to the lyc-opsids; others interpret them as paraphyletic (Crane, 1990), or as the sister group to the lycopsids (Gensel, 1992). 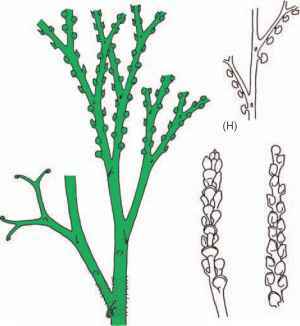 Most zosterophylls exhibit dichotomous branching, although in some genera there is a tendency toward a pseudomonopodial habit; the branching is generally planar (Kenrick and Crane, 1997a) and ultimate branches exhibit circinate vernation (development by means of uncoiling). When specimens are found permineralized, the exarch protostele is more robust than in the rhyniophytes and often elliptical in transverse section. The synapomorphy that distinguishes zosterophyl-lophytes from other early vascular plants is the presence of sporangia that are borne laterally along the stem (FIG. 8.70); they may either be sessile or attached by short branches. In many taxa, sporangia are aggregated often into terminal clusters or cone-like structures. Sporangial shape varies from globose to reniform, with dehiscence typically occurring along the distal edge and separating the sporangium into two valves. Most zosterophyll sporangia also exhibit a thickened zone bordering the dehiscence line. All zosterophyllophytes are homosporous, although the size range of the spores can be rather extensive in some Devonian forms. In other plants that possess zosterophyllophyte features (e.g., Barinophyton and Protobarinophyton), each sporangium contains both large and small spores (Taylor and Brauer, 1983; Chapter 9). separate plants in his early reconstruction. Psilophyton princeps is used for plants with naked or spiny axes and terminal sporangia. Those specimens with spiny axes and lateral, globose sporangia (Fig. 8.70E) are referred to as Sawdonia ornata (Hueber, 1971). A detailed account of the historical development of the problem and its solution can be found in Banks et al. (1975). 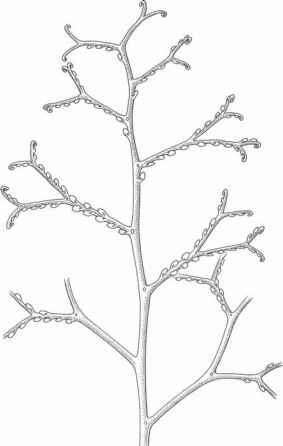 It may be appropriate that Dawson's original description and reconstruction of Psilophyton, which was ignored for so many years, involved numerous researchers and took more than a century to fully understand! distinguish Deheubarthia from Sawdonia. Conducting cells are of the G-type and some epidermal cells possess papillae. Another plant that closely resembles Sawdonia is Discalis longistipa (FIG. 8.73), a zosterophyll from the Lower Devonian of Yunnan, China (Hao, 1989). 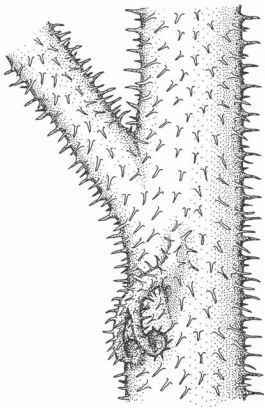 This plant had H- and K-shaped branching with fertile axes bearing large (3.7 mm in diameter) sporangia organized in loose spikes. Multicellular spines occur on all axes, as well as on the sporangia. Based on the presence of radial, trilete spores 30-50 pm in diameter, D. longistipa is thought to have been homosporous. 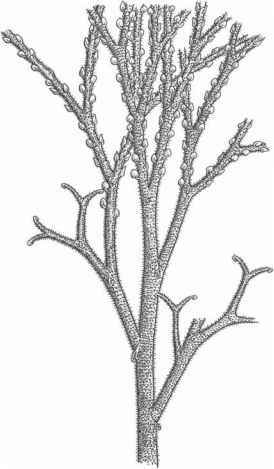 Kidston and Lang (1923) described a plant from the Devonian Old Red Sandstone Series that they characterized as having a tufted growth habit with predominantly dichoto-mous branches. Hicklingia attained a height of ~ 17.0 cm and is known from compressed specimens. Because the sporangia appeared to have been terminal, Kidston and Lang regarded it as similar to Rhynia, and subsequent authors placed the genus among the rhyniophytes. A reexamination of the original specimen by Edwards (1976) indicates that the sporangia were, in fact, borne laterally on the axes, suggesting assignment to the Zosterophyllophyta. Spores are up to 50 pm in diameter and trilete. occur in either one or two rows at the distal ends of branches; they vary from circular to reniform (FIG. 8.74), and each is borne on a small stalk that departs from the axis at an abrupt angle. Vascular tissue has not been identified in the spor-angial stalk. On either side of the distal line of dehiscence is a band of elongated, thick-walled cells, grading proximally into smaller, thinner-walled cells proximally. Spores are ovoid and average 45 pm in diameter. In Z. ramosum the fertile axes branch many times, each terminating in a spike of 8-15 sporangia; trilete spores are triangular with long laesu-rae (Hao and Wang, 2000). Zosterophyll features are present in Macivera gracilis from the Upper Silurian (Ludlovian) of Bathurst Island, Canadian Arctic (Kotyk et al., 2002). In this leafless plant the sporangia are sessile, borne in small clusters at the distal ends of axes, and are not in rows. (FIG. 8.76), the basal region of the plant is characterized by K- and H-type branching patterns. These branching patterns are apparently the result of successive, close order dichotomies. Branching of this type has been described in a number of zosterophylls and is also known to have occurred in some species of the drepanophycalean genus Drepanophycus (Chapter 9). 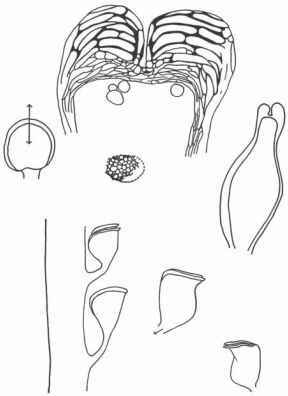 In Z. divaricatum the fertile axes have circinately coiled apices, and the reniform sporangia contain smooth, trilete spores 50-90 pm in diameter (Gensel, 1982b). In Z. deciduum, a compression form from the Lower Devonian (Emsian) of southern Belgium (Gerrienne, 1988), sporangia appear to have been shed at maturity. Recurved branch tips are also present on the Early Devonian (Gedinnian of Germany) Anisophyton (Remy et al., 1986). Spines with truncated apices cover the axes and the sporangia are typically borne on only one side of the axis. Another Early Devonian plant that has features of the zos-terophylls is Guangnania cuneata (FIG. 8.77) (D.-M. Wang and Hao, 2002; D.-M. Wang et al., 2002) from Yunnan Province in southwestern China. Elongate sporangia are borne on upright stalks, are slightly curved, and dehisce into two, unequal valves. Lateral stalked sporangia are also found in Danziella artesiana from the Lower Devonian of France (Edwards, 2006). In Serrulacaulis furcatus (FIG. 8.78) (Upper Devonian), axes are ornamented by two rows of opposite emergences (Hueber and Banks, 1979). The triangular shape of the projections gives the axes a sawtooth appearance. These are now interpreted as triangular, prism-shaped structures that are arranged in two rows in a steplike manner on opposite sides of the axes (Berry and Edwards, 1994). Some axes bear stalked sporangia between the rows of projections on one side of the axis. Sporangia are reniform and borne on short stalks; dehiscence splits the sporangia into two unequal halves. Spores are trilete and ~60pm in diameter. Conducting cells are of the G-type (Berry and Edwards, 1994). plants. The sporangia in Gosslingia occur in definite aggregations in the distal regions of the plant. They are variable in shape, ranging from globose to reniform (Fig. 8.70A,H), and are attached to the stems by slender stalks. Little detailed information is known about the histology of the sporang-ial wall, although some spores have been recovered. These range from 36-50 pm in diameter and are ornamented by small spines. Tarella is an interesting zosterophyll in which the stalked, reniform sporangia split into two equal valves much like those of Gosslingia (Edwards and Kenrick, 1986). The sporangia occur in opposite rows and are not present near the circinate stem tips. Projections, some with hooked apices, are present on both the fertile and sterile axes. Spores are trilete and ~40 pm in diameter. Another zosterophyll from the Lower Devonian of Wales is Thrinkophyton formosum (FIG. 8.79) (Kenrick and Edwards, 1988b). It has pseudomonopodial and isotomous branching and is >9.0 cm tall. The stem tips are circinate with projections borne just below a branch dichotomy. Sporangia are arranged in one or two rows arising from short stalks, and are reniform. The central strand is described as consisting of xylem elements with annular to helical thickenings; xylem maturation is exarch. 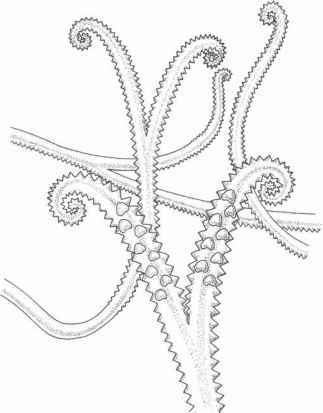 Konioria is an Early Devonian plant from Poland that has branch tips curved to form hooklike ends (Zdebska, 1982). On the surface of the axes are irregularly positioned spines of various lengths, the longest ones (4.0 mm) bearing delicate teeth. The stems also contain winglike outgrowths that are extended longitudinally. In the center of the axis is an exarch protostele. Sporangia were produced on stalks that extend at right angles from the stem just below the last dichotomy. They are typically ~2.5 mm wide and covered by minute spines. To date nothing is known about the spores. Crenaticaulis is a zosterophyll that is known in some detail and thus provides important information about the conducting system and sporangia of this group. Crenaticaulis verruculosus was described from both compressed and structurally preserved specimens collected from Lower Devonian rocks in the Gaspe region (Banks and Davis, 1969). The largest specimen consists of a 22.0-cm-long axis that shows both pseudomonopodial and dichotomous branching. The dichotomies occur at short intervals, and the distal stem tips are slightly coiled. An unusual feature of C. verruculosus is the presence of two rows of multicellular, toothlike protuberances that are nearly oppositely arranged along the surface of the stems. These teeth are triangular and present on the circinately coiled stem apices as well as on the stalks that bear the sporangia. Epidermal cells of the stem are of two types, elongate and papillate. On some specimens, subaxil-lary tubercles are present; on others their position is indicated by an elliptical scar. The exarch strand is elliptical in cross section and composed of G-type conducting elements. 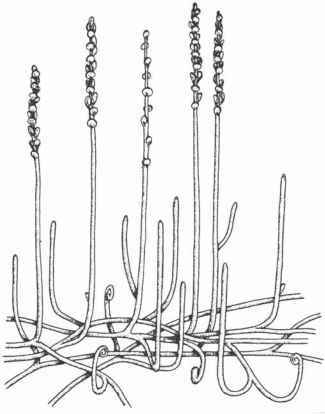 The sporangia of C. verruculosus are clustered and occur in opposite-subopposite groups on the distal branches. They are pedicellate and nearly spherical in outline. Sporangial dehiscence has been termed distal—beginning on one side just above the attachment to the stalk and arching over the adaxial face to the opposite surface. Dehisced sporangia consist of a large abaxial and a small adaxial segment; nothing is known about the spores. indicating a basipetal form of dehiscence. Rebuchia ovata was probably homosporous; all the spores recovered are unor-namented, 68-75 pm in diameter, and of the Retusotriletes type. Another plant that has aggregations of sporangia in what might be termed strobili is Bracteophyton variatum from the Lower Devonian of China (Wang and Hao, 2004). Individual sporangia are adaxial and associated with pairs of bracts, or with a single bract that bifurcates at the tip. Sporangial dehiscence is distal. Axes are isotomous, naked and up to 4.7 mm in diameter. Nothing is known about the anatomy. 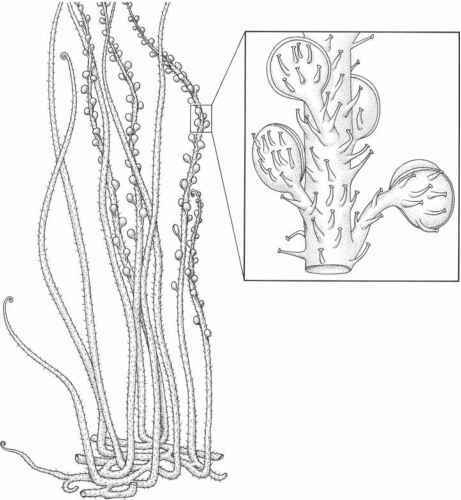 Kaulangiophyton is an Early Devonian plant consisting of a horizontal branching system that bears numerous, irregularly spaced, short spines (Gensel et al., 1969). The spines are slightly curved and up to 2.0 mm long, with decurrent bases. Sporangia are borne on short stalks along the stem and appear to be interspersed among the spines, giving this plant the appearance of modern species of Lycopodium. No spores have been recovered, nor is anything known about the vascular system. In many features, K. akantha is similar to Drepanophycus (Chapter 9).